Suzanne Collins achieved fame through her dark and dystopian Hunger Games series. Her latest offering is neither a dystopian tale nor a children’s fantasy series; instead she has written a picture book. 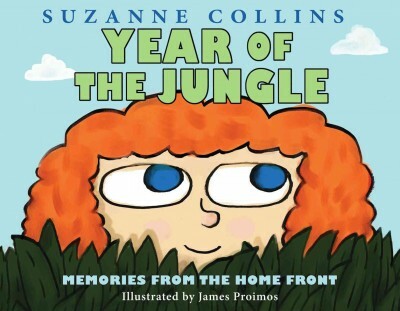 Year of the Jungle is four-year-old child’s view of Suzanne Collins’s own experiences when her father was deployed to Vietnam in 1968. Because Year of the Jungle is the newest book from a bestselling author, it has garnered a lot of attention. One review said that it would “bewilder” its intended audience of small children. Considering that over two million American children have had a parent deployed since 9/11, it must be a familiar story to many. Of course not all of them had exactly the same experience as Suzanne Collins, but many have had similar enough experiences that they will not be bewildered by this book. Suzy hears that her father “has to go to something called a war,” leaving her not knowing “what anybody’s talking about.” She also learns that he will be in a jungle. Suzy knows about jungles from cartoons so she pictures her father in a happy place among her favorite cartoon characters. In a strong portrayal of a small child’s misunderstanding of the passage of time, Suzy is confused about the length of the year he will be away. The book portrays Suzy’s growing unease as adults give her unlooked-for sympathy, showing how adults can make things worse, even though they are trying to be kind. Suzy loves getting her father’s postcards, but they start coming less frequently and start to change. But for a child about to turn five the most devastating thing is the realization that he sent a birthday greeting to the wrong sibling. In the illustrations the cartoon jungle full of round and smiling animals changes into a far more sinister place with images of violence and fear. It is hard not to speculate how Suzanne Collins’s early experiences influenced her imagination when writing her undoubtedly dark and violent Hunger Games series. As an excellent writer she has captured and condensed a world of childhood experiences into a very few words. James Proimos’ illustrations are of a rough cartoonish style that at first glance I didn’t find very attractive, but they do a great job of capturing Suzy’s innocence and her unusually early realization of the dangers of the world. This is a picture book designed to be read aloud, and a parent or caregiver can judge if it is the right book for their child. I think it could be useful for young military children as it is ultimately comforting when her father returns safely, although it is so dark in places that an adult should read it first and decide if it is appropriate. I also recommend it for adults who are interested in Suzanne Collins, military children’s experience, or a darker picture book. Check the WRL catalog for Year of the Jungle. Thanks for this post… Now I know where to go to in case I want to buy a book I’m not sure of. Yes, the library is the place to go to find out about books you are not sure of! Working in a library, I check out lots of library books, but I also find many that I want to buy.